Morocco international Achraf Hakimi hailed an unforgettable first goal for Real Madrid as he became the first Moroccan and sixth African to score for the European giants. 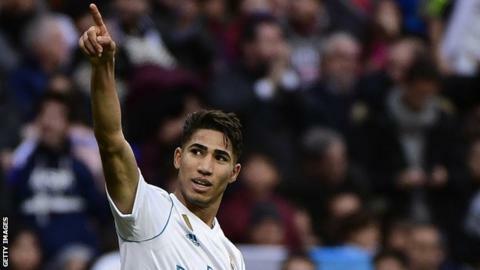 Defender Achraf, 19, is enjoying a breakthrough season with Real Madrid and marked his fourth league appearance with a goal in the 5-0 thrashing of Sevilla on Saturday at the Bernabeu. "A match that I will never forget. My first goal with Real Madrid and a great victory for the team. Very happy," he said on Twitter. Cameroon's Samuel Eto'o and Cape Verde's Valmiro Lopes Rocha both failed to score for the 12-time European champions in an official match. Back in October, Achraf made his debut against Espanyol, becoming the first Moroccan to play for Real Madrid and the youngest player in La Liga this season - at 18 years 10 months 27 days. He also started for Zinedine Zidane's side in this season's home and away Champions League match against Tottenham Hotspur. Born in Madrid and eligible for Spain, Achraf represented Morocco at youth levels before Atlas Lions manager Herve Renard handed him a senior debut in a 4-0 friendly win against Canada in October 2016. Achraf made four appearances and scored once in the 6-0 annihilation of Mali as Morocco sealed 2018 World Cup qualification.